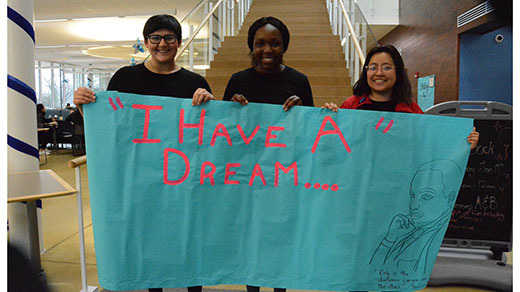 UIU students Gabrielle Palomo, Janefa James and Lily Diaz (l-r) worked together to create a poster and help organize the “I have a dream…” event to be held on Martin Luther KIng Jr. Day at UIU..
As part of Martin Luther King Jr. Day on Monday, January 21, Upper Iowa University students, faculty and staff will have the opportunity to pen their dreams for the future of society. In honor of the late civil rights leader Martin Luther King Jr., Gabrielle Palomo, a freshman forensic science major from Homewood, Illinois, and Egdalith Diaz, a senior graphic design major from Chicago, Illinois, Janefa James, a junior art major from Des Moines, Iowa, worked together to create a poster and help organize the “I have a dream…” event. The poster will be located near the front doors to the north entrance of the Student Center during the lunch hours at Fayette Campus on Monday, January 21.